North Star Marketing - Local Agency puts Little Black Book Online! North Star Marketing, a leading marketing and branding agency in Lancaster, PA has recently entered the world of ecommerce. Two books, “The CEO’s Little Black Book on Branding” and “The Power Principles of Marketing,” both authored by CEO and founder, Kae Groshong Wagner, have been added to their online store for purchase. To access the store, visit northstar-m.com. Besides being able to purchase each of the books online, the store also allows users to read excerpts from both of the books. And as a special offer, when you order "The CEO's Little Black Book on Branding" in February ’06, you’ll receive "The Power Principles of Marketing" free. 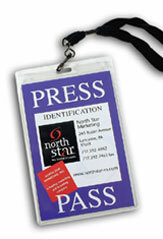 North Star Marketing is a unique marketing and branding firm with 17 years of marketing, branding and public relations services. Call (717) 392-6982 for more information or visit northstar-m.com. Although the Little Black Book on Branding is written for the CEO, the material applies to everyone who is working on a brand. And, since branding is for everyone, the 8 Brand Building Blocks and the Brand Basics that Wagner covers in her book help readers to identify their own brand strengths and areas of development. This book is full of helpful branding concepts, as well as everyday tips that every businessperson, from the CEO to the Sales Team, will find of value.